Miracle in the Rain is a rare film. Directed by Rudolph Mate, it has all the hallmarks of a tearjerker, but it’s so much more than just a doomed romance. It’s almost too pure. It also helps that screenwriter Ben Hecht, who was primarily known for cynical stories, wrote the novel. I felt like I stumbled upon a jewel hidden in a grimy street corner when I first watched it. Maybe all the ugliness of the world makes it shine that much brighter. 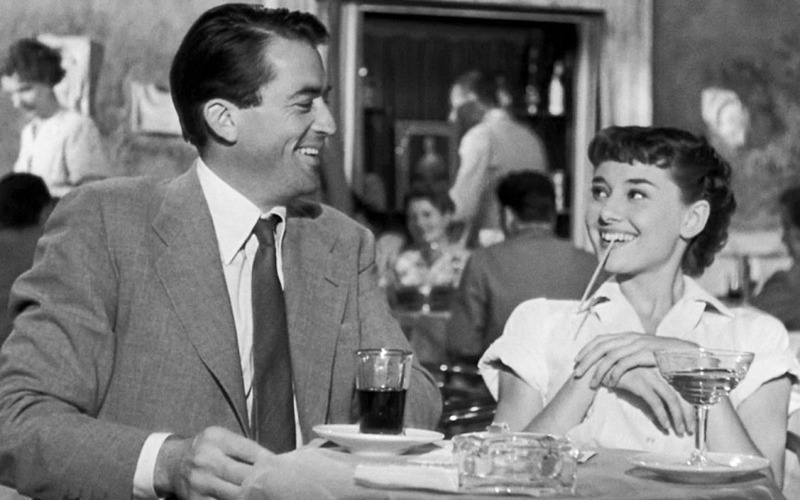 In a TCM introduction by host Ben Mankiewicz, he mentioned that Audrey Hepburn expressed interest in appearing in the film. I screamed. Having just discovered that Van Johnson was an ardent admirer of Audrey (and apparently a good friend), the idea of them in a film makes me, well, scream. If she had scored the role, I think the film would be much more famous today. I guess this is what fanfiction is for? Nevertheless, Van’s actual leading lady, Jane Wyman, was splendid. Also worth noting that Van thought his friend Robert Walker would’ve been excellent as the male lead. After watching the film, I agree, but Van was still incredible in it. Bobby Walker died in 1951 and Van said that he thought of him every day while filming. My poor, weak, fragile heart. Bobby and Van on the set of Thirty Seconds Over Tokyo (1944). Miracle in the Rain is the perfect antidote to cynicism. Although I’ve given up hope of finding a guy as exceptional as the scores of dead men I’ve fallen for, or the ones in movies and books, it cured my cynicism in other ways. It’s made me hope for Art Hugenon. Van Johnson may no longer be with us, but he’s made me believe that Art is. The film was shot on location in New York and the opening narration takes full advantage of that. A towering, golden city with wonder filled streets. Unpopular opinion: New York has never really enchanted me. Good to visit, but I wouldn’t want to live there. Maybe it’s because I live in a big, bustling city myself. If you’ve seen one, you’ve seen them all. But New York is a perfect setting. So many people rushing around, so many lives and stories unfolding. What are the chances that you could meet your soulmate out of millions of people? There’s a lot to be said about rom coms fostering unrealistic expectations, but romantic melodramas like this one completely undermine them. They set you up for ideals and then deal a crushing blow by not fulfilling them. Miracle in the Rain first introduces us to mousy secretary Ruth Wood (Jane Wyman). She’s certainly not the kind of person you double back to get a glimpse of, even though Jane Wyman was very pretty. Ruth’s loneliness is evident in her very being; she doesn’t have to say a word. We learn that she’s single and taking care of her mother. She already has the makings of a Shirley Jackson heroine. I’m finding myself drawn to stories about lonely women, particularly those who spend their time and energy caring for others. And I’ve always felt that in both fiction and real life, taking care of a parent is a taxing job, one that inspires way too much guilt if you desire a different life. But her mother isn’t a burden and Ruth graciously accepts her lot in life. When Ruth’s coworker and friend Grace (Eileen Heckart) invites her to a movie, she declines on account of her mother. As she’s leaving work, it begins to rain. (Aha! There’s the rain from the title). Ruth decides to wait for it to clear up. A guy in the vestibule is just chatting away to no one in particular. He’s making conversation about the weather but besides some polite nods and smiles, everyone is ignoring him. Soon this Chatty Cathy starts addressing Ruth, who isn’t trying to pay any attention to him. But he tells her that there’s no point in waiting for the rain to stop. And then he cheerily takes her grocery bags and bundles them under his coat. Ruth is stunned by this stranger. She ends up catching a bus ride with him. His name is Art Hugenon (Van Johnson), an army private. From the very moment we first meet him sheltering from the rain, we know that he’s Ruth’s polar opposite. Cheerful and friendly where she’s reticent. Art has no problem striking up conversations with strangers and it’s clear that he’s at least minimally aware of how odd he is. After he learns Ruth’s name, he says that she seems like a girl he can trust. A fellow like him can’t ever be too careful in a town like this. I mean. Art invites Ruth and her mother to dinner, but she explains that her mother never goes out. So he invites himself to her house for dinner and they pick up more food on the way. This is important: Art isn’t a smarmy jerk just inserting himself into Ruth’s plans. He’s odd but harmless. When Ruth and Art arrive at her house, her mother, Agnes, is not at all pleased. In fact, she’s angry and bordering on hysteria. We learn later that Ruth’s father abandoned the family when she was a little girl and her mother never fully recovered. She’s made one suicide attempt, so it becomes painfully clear why Ruth doesn’t have a life outside of home. Her mother is distrustful of Art from the moment she meets him. She insists that all men are the same and that he’s going to hurt Ruth. That’s really my only minor quibble with this film, the handling of her character. I know that people’s whole lives are shattered following heartbreak (you will remember Robert Walker at the beginning of this post), but I guess her hatred for all men was too excessive and unrealistic in my eyes. It was as if we were supposed to pity her and that was all. But Josephine Hutchinson was more than effective at portraying an emotionally wounded older woman. Agnes is still suspicious, but Ruth thinks Art is wonderful. He tells her about his life, his aunt Sara, his resistance to working on his family’s farm, and his writing aspirations. Here’s someone without a trace of artifice, who wears his heart on his sleeve and isn’t at all self conscious about saying just what he feels. Art was making heart eyes at Ruth from the moment he saw her, but it escaped her notice. They’re lonely people who have made a connection, yet they express their loneliness in distinct ways. Ruth is withdrawn but Art reaches out to people. I love that this film portrays an extrovert who experiences loneliness. Ruth is the first friend he’s made, but how many other people did he try to befriend? And even though Ruth was initially reluctant, she did warm to him. They’re both very good for each other. Even before their friendship turns to romance, Art changes Ruth’s life, sometimes without even knowing. Her father sees her for the first time in years and contemplates reentering her life, yet he’s cowed by shame and regret. Art is just so open and friendly with everyone; he makes me second guess ignoring strangers. And when Ruth is with him, she smiles so much more. He gives her a new outlook. His enthusiasm is far reaching too, affecting everyone he comes into contact with. Pretty soon, Art’s division is shipped out overseas, which means a brief farewell. It was this scene that made me break down in tears, even before anything happened. But my instincts knew tragedy was on the horizon. I know I looked like an idiot with tears streaming down my face while nothing bad was even happening. It was actually a heartwarming scene. You can probably guess that Art doesn’t come back. Remember, this is a romantic melodrama. It lifts you up and then pushes you down, adding in a kick for good measure while you’re still splayed on the ground, bleeding. I cried so hard that I got a headache. Ruth’s grief is so profound that she becomes despondent. The only thing that gives her purpose again is lighting a candle for Saint Andrew at Saint Patrick’s cathedral. The allusions to faith were sweet but not overdone. I especially love how the church was a refuge even for non Catholics, and it totally is. Ruth doesn’t ever find closure through the faith, and I liked that. She’s hesitant about formal religion, but as any Catholic will tell you, the church loves you anyway. She’s not a member but she’s still welcome. And it’s quite fitting that the church is the site for one more miracle. Not sure if my writing conveyed this, but both stars were in top form here. Jane Wyman, from what I’ve seen, was really adept at lonely and/or downtrodden women who aren’t pathetic. If this was a different story, I’d want Art to leave her alone. Not all women are vivacious and sparkling. Sometimes they’re just quiet and reserved. It’s good to see variety in our heroines. Jane Wyman pulls this role off seamlessly. Van Johnson was the cheeriest guy ever, and undercutting all that smiley-ness with a dash of loneliness is a brilliant touch. Art is just very special. And I can’t imagine anyone but Van playing him. Van Johnson was nicknamed The Voiceless Sinatra which I don’t understand at all because he had a pleasant singing voice, which you can hear in this film. He even starred in the 1961 production of The Music Man in London. I might still prefer Robert Preston’s versions of the songs, but Van’s are so good! I guess he was voiceless because crowds of teenage girls were mobbing him for his movie work and not his singing. Have these pictures of him with Frank Sinatra. Art recites a poem for Ruth, the same one from Roman Holiday. I got very excited about that. So there was an Audrey connection after all. In the Acroceraunian mountains.” Keats! It’s Shelley. Miracle in the Rain ends rather ambiguously. Ruth’s situation is not entirely resolved, but the film’s conclusion does strike a hopeful and miraculous note. Love is transformative. Next Post 2 Howard Keels are better than 1.